SMS has long been the whipping boy of the messaging world. Compared to the latest breed of messaging apps, SMS can appear slow, expensive and full of unnecessary constraints. With WhatsApp now sending over 50% more messages every day than SMS, most argue that it’s only a matter of time before it’s killed off entirely. And yet in spite of the explosion of new messaging apps, SMS is proving itself as the cockroach of messaging formats. Every time we think it should die it reappears with a new use case. In the past year, SMS has been biting at the heels of how we interact with mobile apps and services, with very real advantages over other communication mediums. We’ve written extensively about the fact that users, and businesses, are slowly turning away from native apps, despite spending more time on mobile than ever before. In large part, users are moving towards quick and easy interfaces such as browsers and messaging apps. SMS is the apex of this. Not only does it allow you to see the value of a service without having to download anything, it is almost always faster to shoot out a text message than load a mobile app or a mobile web page. There are also a few other distinct advantages to SMS, that aren’t shared by other messaging services, at least right now. People actually read them. 98% of all SMS messages are read, and 90% are read within three minutes of being received. As SMS is largely used to communicate with close friends and family, it gives businesses an opportunity to directly reach their users. To put it bluntly, when someone receives an SMS, they open it. Reliably identify users. The PSTN (public switched telephone network) is probably the world’s largest identity platform. Unlike email, users rarely change their phone number and they rarely have more than one. With SMS, you’ve got a permanent connection with users that’s hard to fake, meaning less fraudulent and duplicate registrations. Reach a broad audience. With over 4 billion active users, SMS is still the most used messaging application in the world. As it doesn’t require large amounts of data or an internet connection to work, almost everyone with a phone, smartphone or not, knows how to use SMS. Ubiquitous. With each new messaging app, we need to learn how to use it. All share the familiarity of text, but there is a learning curve associated with all of them. What works in Line does not automatically translate to Telegram, and vice versa. Of all the messaging interfaces, SMS is the most direct. No custom UI, no learning curve. Admittedly, the canvas with which SMS operates is limited. But that means end users can focus less on the software and the interface and more on the job. Rarely does SMS get in the way. 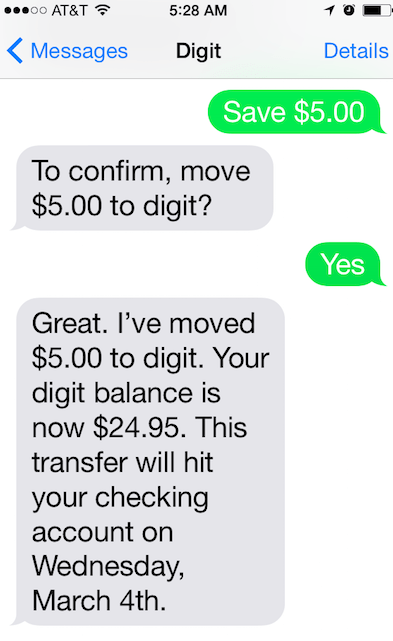 Take Digit, an automated savings service that uses command-based SMS messages. It analyzes my spending, siphons little chunks of money out of my checking account, and puts it in a secure Digit savings account. No app, no complex spending charts, no goal setting; and the best part of all – it all takes place over text. What’s important is that with SMS, the UI is not the product itself. It’s only a means of allowing users to access the product. The scaffolding. For Digit and Magic, if SMS is the easiest access point for its users, then it definitely should be. It’s not hard to extrapolate SMS beyond the narrow context of on-demand apps and services – towards business messaging based around customer support, marketing and sales (In fact, this is already possible with Intercom). Given how badly SMS has been applied up until this point, with little or no attempt at personalization, we’ve become (rightly) sceptical of SMS as a business messaging medium. But the likes of Yelp (to manage and update booking reservations) and Airbnb (for time sensitive communications such as accommodation updates) are already using SMS to manage customer support and sales. 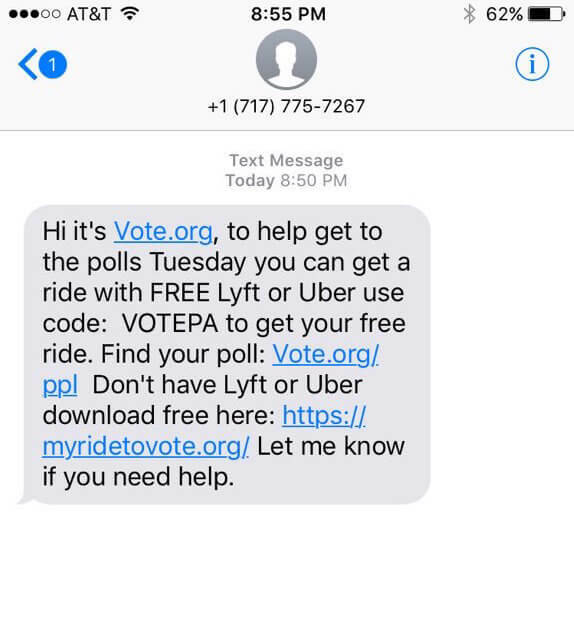 One of the best examples of SMS in this context was Vote.org’s use of SMS in the recent US election campaign. With 96% of people under 35 having access to smartphones, they relied on the mass coverage and access of SMS to handle conversations on voting registrations. Using SMS for customer support means they don’t have to worry about audience access, bandwidth and latency issues, or any of the other issues that can come with a mobile app or website. 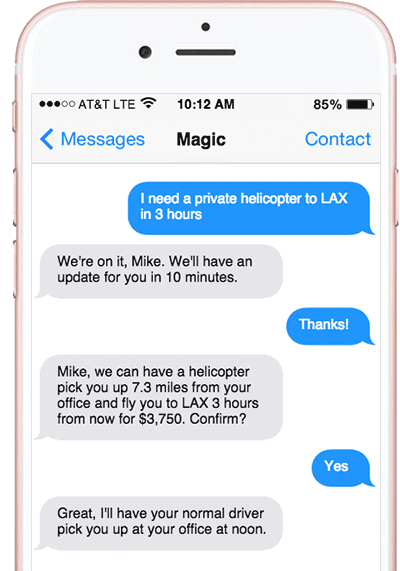 Most assume we’re heading towards a winner-takes-all future where all our messaging will take place in one app. But the resilience of SMS shows us that talking about winners and losers is the wrong conversation. People can use several messaging apps at once, for different purposes. Smartphones are with us literally everywhere and there is so much more within us than any one messaging app can capture. It’s very difficult to see how one messaging channel will ever be used for all personal and business communication. Using one of these apps doesn’t preclude me from using another. They all have different use-cases, and they all happily co-exist. So while much of the past few years have focused on consolidation, we’re likely to see even more fragmentation in our messaging behavior on mobile in the coming years, not less. And SMS, the simplest and most ubiquitous of all, will continue to be one of them.